Foundation Professionals of Florida has locations in Lake City, Jacksonville, Tampa Bay, and Pompano Beach with Lake City being the corporate location. The Foundation Professionals of Florida team prides themselves on being leaders in the geotechnical industry. They believe in focusing on details and established procedures so they can eliminate errors before they occur. This mission results in the highest level of reliability and confidence that their customers expect and deserve. This is why ECP is proud to have them as a contractor partner and they are our current partner spotlight! We are excited to see Foundation Professionals of Florida continue to provide excellent customer service and excel with their foundation repairs. 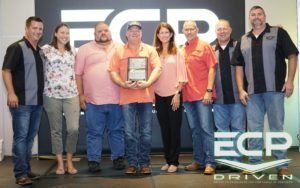 They were an wonderful ECP contractor in 2018 and won the 2018 Core Installer Award. If you are located in or around the Florida area, we recommend you contact Foundation Professionals of Florida. They are a great business, and we are so happy to have them as an ECP Contractor Partner!